£65 per person for the two days covers all workshop costs, including film and prints. Please pay in advance to secure a place. Attendance on both dates is highly recommended. Workshop takes place at Basic Mountain, 1a Hill Street, Edinburgh, EH2 3JP, central Edinburgh close to Waverley and Haymarket Railway stations and the bus station at St Andrews Square. Workshop starts promptly at 10.00am. With thanks to Naomi Garriock. 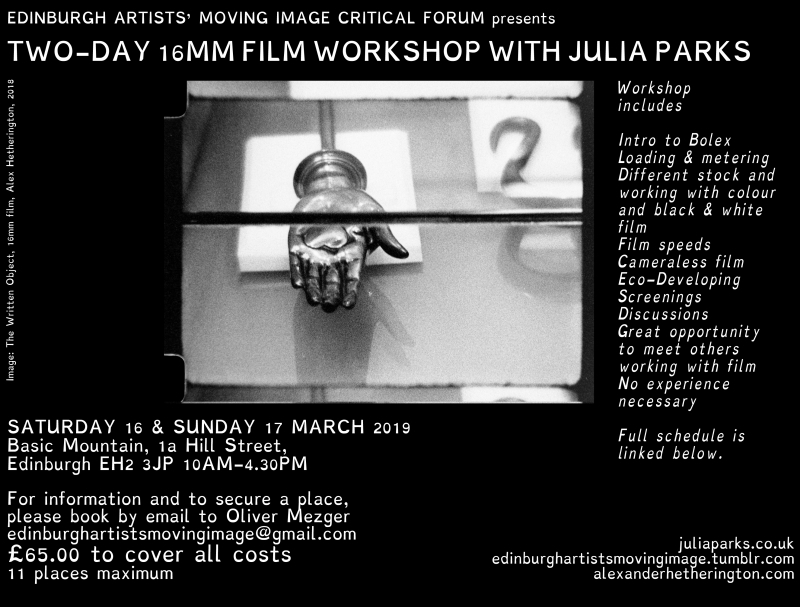 Julia Parks’s practice encompasses film, animation and photography, often using series of photographs and projected 16mm film. Through this medium, she explores the different relationships between landscape, place and people, often focusing on the west-coast of Cumbria. Having graduated from Central Saint Martin’s School of Art in 2015, Julia has since exhibited work in exhibitions and film festivals in the UK, Europe and Japan. She organised the Arts Council-funded residency, The Allerdale Film Farm, which explored handmade 16mm film making in West-Cumbria.